1. The act of giving up something; such as, power, land, or rights to another person, group, or country: The law required the cession of the property to Jacob's heirs. 2. 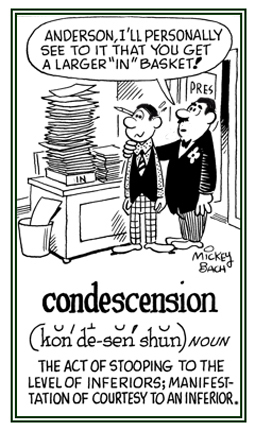 Etymology: from Old French cession, from Latin cessionem, from cess-, stem of cessare, "to yield". 1. 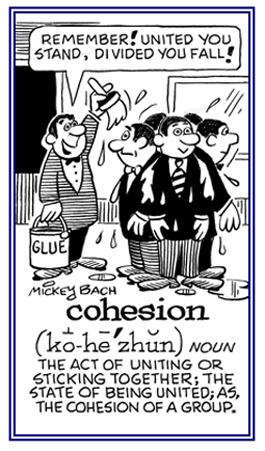 The action, or a condition, of uniting together: A social group, a chemical mixture, etc. are parts that make up a unified cohesion by holding together firmly or existing together without conflict. If people want to maintain their cohesion, then they must not let minor differences of opinions interfere with their major objectives. A written story whose facts all make sense and fit together has cohesion. 2. Particles of the same substance sticking together: Cake batter usually has cohesion because all of the ingredients are mixed together and cannot be separated again!. Tar as a substance has cohesion and so does glue. A violent forcible contact between two or more objects or things: The midair collision of the two airplanes resulted in the death of all of the passengers and the flight personnel. The traffic was snarled because of the collisions between two large trucks; fortunately, no one was killed or injured. 1. Literally, a playing together, or into each other's hands: Jacob and Ronald were acting in collusion with the objective of stealing the valuable violin when the musician wasn't looking. The collusion of the truck drivers to secretly change the speed limit signs on the highway almost resulted in disastrous collisions during the heavy rain storm. 2. 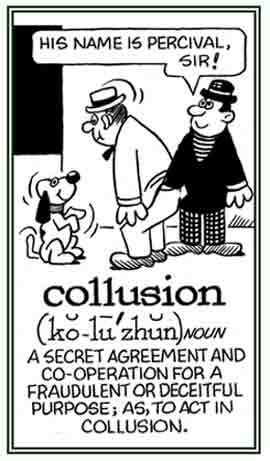 An agreement or understanding for purposes of trickery or fraud: The extent of collusion to which Jeff, the farmer, did to fool his neighbor into giving him pasture land was astonishing. 3. 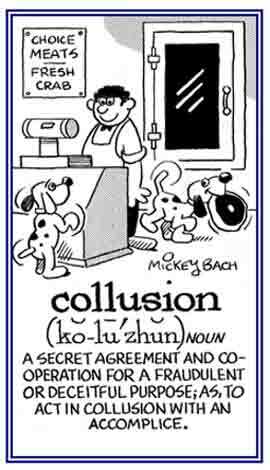 A secret agreement or working together for what is typically an illegal purpose: When the oil well failed, the operators suspected a collusion between the teams of workmen. The reporter revealed the collusion between some city officials and certain local businesses to keep the commercial taxes low. 4. 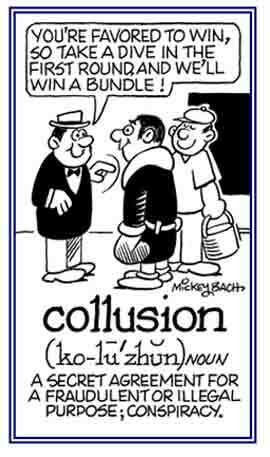 Etymology: from Old French collusion; from Latin collusionem, "act of colluding"; from colludere, from com-, "together" + ludere, "to play"; from ludus "game". © ALL rights are reserved. 1. The act of granting certain powers or the authority to carry out a particular task or duty: The congressional committee received a commission from the President to investigate the wrong doings of the security agents. 2. An organized group of individuals, often governmental, appointed to investigate questionable activities; such as, irregularities in the construction business: Mary's uncle was appointed by the city commission to determine if the contractors were building the new housing areas according to the standards established by the city council. 3. A fee or percentage allowed to a sales representative or an agent for services rendered: When Alison bought her condominium, she paid a 2% commission to the real estate agent who facilitated the transaction. 4. An official document issued by a government agency conferring a rank on an enlisted person in the armed forces: Silvia's colonel made an official statement that she had received a commission as a sergeant. 1. A quality of the humane understanding for the suffering of others and wanting to do something to help them: It was due to Katherine's deep compassion for the pain and suffering of small animals that helped her decide to attend veterinary college and become a veterinarian. 2. 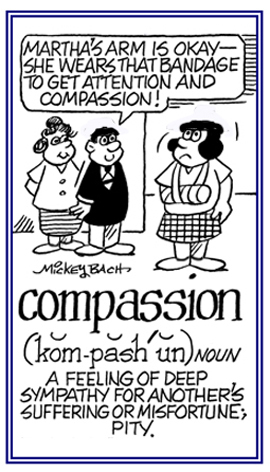 Etymology: from Latin com-, "together" + pati, "to suffer". © ALL rights are reserved. The act or fact of grasping the meaning, nature, or importance of something and understanding it: The librarian noticed when the students started to smile after her explanation of a topic, that it was a sign of their comprehension and even agreement with what she had said. The act or process of applying pressure to make something smaller or to increase its density: When she packed her suitcase, Lucy applied compression to the plastic bags in which she had packed her clothing, squeezing out the air in them and making the pile of clothing in her luggage smaller so it would take up less space. A desire or feeling that a person has that he or she must do something; an irresistible inclination to do or repeat an activity: Richard, an international traveler and explorer, described his compulsion to visit far away places as something he could not resist and he frequently felt a compulsion to climb the highest mountains wherever he went. Tom's doctor described him as having a compulsion to repeatedly wash his hands even when they were clean. 1. An act or an example of yielding or compromising in some way, often grudgingly or unwillingly: Despite wanting an informal celebration, Mr. Simmons, as a concession to his wife, reluctantly agreed to go out to dinner with friends to celebrate her birthday instead of staying home. 2. A privilege, right, kindness, etc. that is granted to a person or group, usually as a result of special circumstances: The university granted a concession to three visually impaired students who required the assistance of a personal reader so they could complete their final examinations. 3. A space or privilege within certain premises for a subsidiary business or service: Jerry had a refreshment concession at the local movie theater. 4. Something acknowledged or admitted: The land survey and the farmer's long held belief about land boundaries differed and the farmer granted the concession that the survey was correct and so he withdrew his complaint about errors that were made prior to the sale of his land. 5. 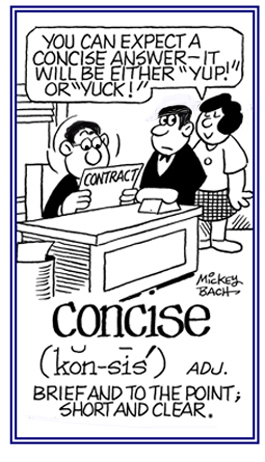 Etymology: from Latin concessionem, from concessius, past participle of concedere, "to go, to grant, to give way". 1. Concise quality or terseness: The quotation from Shakespeare, "Brevity is the soul of wit" is an example of concision when making a speech or giving a talk. 2. Archaic, a cutting up or off; mutilation: The soldiers of ancient times suffered severe concisions in the battlefield when they were fighting other warriors who were using swords and pikes. 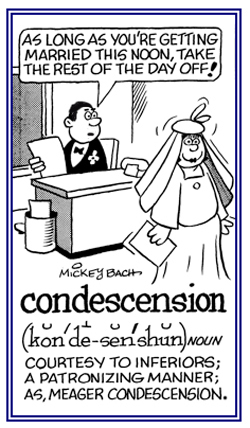 The cartoon provides a clear understanding of what this concision word means. 1. A final settlement: The conclusion or completion of a business deal was achieved by Mark and his colleagues. 2. The act of making up one's mind about something: Jerry made his conclusions to quickly have surgery after he discussed the problem with his doctor. 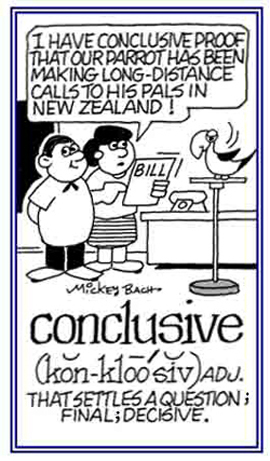 The woman in the cartoon came to the conclusion that the parrot made the long distance phone calls. 1. An injury to the brain, often resulting from a blow to the head, which can cause temporary disorientation, memory loss, or unconsciousness: The ice hockey leagues are studying changes in helmet requirements because of so many concussions that the players have been experiencing. 2. A damage to an organ of the body which is usually caused by a violent blow, a shaking or some suddenly violent jolting: The automobile accident caused several internal concussions to Mrs. Jackson and so she was unable to continue driving her car anymore. A voluntary presentation of equality with another person or people who are regarded as being inferior: The company's executive officer's condescension implied that he was lowering himself to the level of other employees who were less important or intelligent than he was. The reporter wrote an article in which he discussed the politics of his city without condescension or suggesting that he knew much more than the readers did about the situation. 1. An admission of having done something wrong or embarrassing: The three children appeared uneasy when they made a confession to their mother that they had eaten all the cookies she had baked without letting her know about it. 2. In law, a voluntary written or verbal statement admitting the commission of a crime: In order to avoid a long court procedure, Julia's lawyer convinced her to write a confession in which she stated that she had robbed two banks in the city. 3. A profession of emotions or beliefs; such as, love, loyalty, or faith: On Valentine's Day, Mark made his confession of love for Darlene and asked her to marry him. 4. A formal declaration of sins made confidentially to a priest or to God: Sara made her confession in her church the first Sunday of every month, as well as on her birthday, confiding to the priest what she believed were her sins and asking for God's forgiveness. 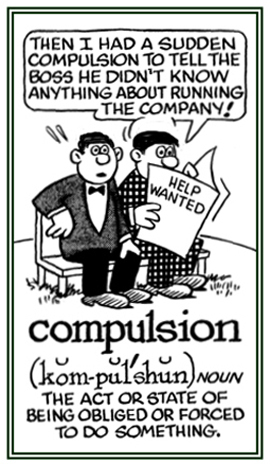 Showing page 2 out of 10 pages of 146 main-word entries or main-word-entry groups.